This week on The Vampire Diaries (Season 3, Episode 10), Stefan steals coffins and makes Klaus angry. Read Kidzworld’s recap of “A New Deal”, which aired January 5, 2012, to discover what you missed. The Vampire Diaries returns this week after their mid-season break, and all bets are off. The characters are dealing with the consequences of betraying Klaus. Stefan has disappeared, and he has taken coffins with Klaus’s daggered family members. Klaus is not happy, and lets Damon and Elena know about it. 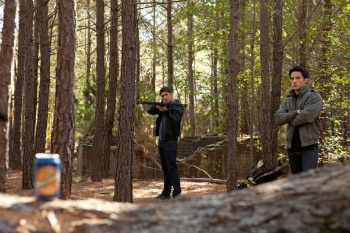 If they don’t find the caskets, Klaus says he will start killing off Elena’s loved ones. Since Tyler is now a hybrid, he is under Klaus’s control. He gets Tyler to weaken Jeremy and make him take off his ring and vervain bracelet. Klaus compels Jeremy to commit suicide by standing in the middle of the road. Luckily, Alaric steps in at the last minute to save him. Damon then compels him to leave town, so Jeremy goes to visit friends in Denver where he will be safe and away from trouble. Bonnie is haunted by one dream that keeps coming back every time she falls asleep. 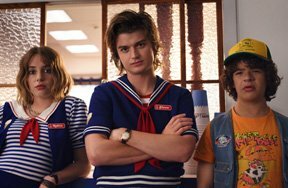 In the dream she is led to the basement of a house, where there are four coffins. Convinced it is more than just a nightmare, she tracks down the house in real life. But, instead of coffins, she finds Stefan. He shows her one coffin that will not open, regardless of what they try. What’s inside? 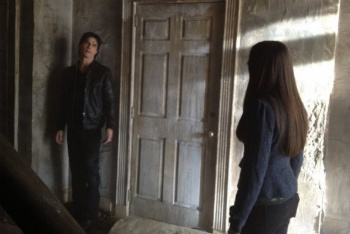 Damon and Elena track down Stefan, and try to convince him to give the coffins back. But, Stefan won’t agree to the plan. Damon loses it on his brother, and makes Stefan tell him the real reason he ruined their plan last episode. The incident brings Damon and Elena closer than ever, and they finally share a real kiss!! 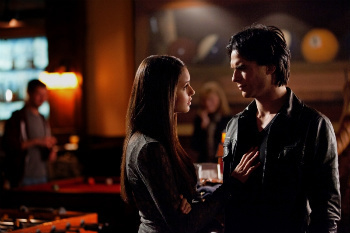 Do you think Elena and Damon’s relationship will finally move forward? Are you on team Damon or team Stefan? Leave a comment and let us know!